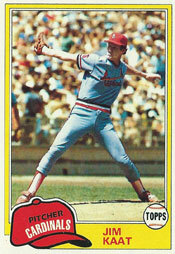 Jim Kaat was 41 when he stole a base and hit a home run in separate games for the 1980 Cardinals. At an age when most players are retired, Kaat still pitched effectively and remained a complete ballplayer. On June 23, 1980, two months after he had been acquired from the Yankees, Kaat earned the win and pitched a complete game for the Cardinals in their 6-1 victory over the Pirates at St. Louis. Kaat didn’t allow a walk or an extra-base hit. He held the Pirates scoreless over the last seven innings and earned his 266th career win, tying Hall of Famer Bob Feller. In the seventh, he stole a base. Bobby Bonds was at the plate when Kaat dashed for second. Bonds took a pitch from Enrique Romo. Catcher Steve Nicosia gunned a throw to Phil Garner, covering second. Kaat beat the peg. The fans at Busch Stadium rewarded him with a standing ovation. The steal was Kaat’s first in nine years. He was 32 when he swiped a base for the Twins against Yankees pitcher Stan Bahnsen and catcher Thurman Munson on July 30, 1971. His stolen base for the Cardinals was Kaat’s fifth and last in a 25-year career (1959-83) in the majors. Two months after his steal for the Cardinals, Kaat hit a home run for them. On Aug. 26, 1980, Kaat homered off the Astros’ Joe Niekro at St. Louis. The home run was the last of 16 hit by Kaat. He slugged his first 18 years earlier on June 19, 1962, off Dom Zanni of the White Sox. The next year, Kaat, 43, appeared in 62 regular-season games for the Cardinals (earning five wins and two saves) and pitched in four games of the 1982 World Series against the Brewers. Kaat was 19-16 with 10 saves in four seasons (1980-83) with the Cardinals. He’s a Hall of Fame candidate primarily because his 283 career wins rank eighth all-time among left-handers and because he won 16 Gold Glove awards for fielding. He has more career wins than several Hall of Famers, including Jim Palmer (268), Carl Hubbell (253), Bob Gibson (251) and Juan Marichal (243).